Pleasant Valley Greenhouse & Nursery Inc. Pleasant Valley Greenhouse is located in Olean NY and offers all you need to make your home beautiful! Open April-December, you can find greenhouse flowers, hardy fall mums, quality annual and perennial flowers, vegetables plants, small fruit bushes and fruit trees. In December, pick out your Christmas tree or decorate with poinsettas. Landscape design assistance and trees and shrubs especially suited to our climate in Cattaraugus County. Owner Dan Evans has a degree in ornamental horticulture and 38 years experience......so he knows what he is doing! 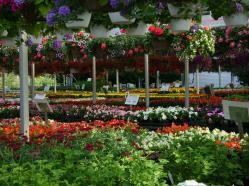 Pleasant Valley Greenhouse & Nursery, Inc. of Olean has been open for over 30 years. We have the Southern Tier’s most extensive selection of hardy plants, annuals and perennials, fruit and vegetable plants, hanging baskets and trees and shrubs. All are products are selected especially for our area and our unique climate. During the Holiday season we have fresh cut, locally grown Christmas trees, fresh evergreen wreaths, seasonal decorations, and poinsettias and other Holiday flowers. We also carry decorative pottery pots, wall art and wind chimes, beautiful bird houses and glazed ceramic bird baths. Our business hours vary with each season. We are open daily from Monday through Saturday and on Sundays in May, June and from Thanksgiving through Christmas. Visit their website for fun tips, coupons, details on seasonal items and more!